If you said nose, you're wrong. A deer's primary survival mechanism is its stomach, at least according to whitetail guru, Neil Dougherty. Thousands of years of evolution have left deer with a highly specialized stomach that allows them to feed for a short burst of time and then go lay down to digest their food. Deer are most vulnerable when they're moving or browsing and least vulnerable when bedded. Being able to fill up quickly and then lay low keeps them alive. How often do they need to feed? During the early fall deer spend much of their time feeding on low-fiber food sources like fruits and forbs(weeds). Low fiber foods digest quickly and deer may feed every four hours. During late fall, deer typically feed on higher fiber plants like tips of trees and nuts. High fiber foods take longer to digest, so in this case deer will typically need to feed every seven hours. So what does this mini-zoology lesson mean for hunters? "Deer are slaves to their stomachs," Dougherty says, quoting one of his mentors and fellow whitetail expert Grant Woods. In short, if you want to find deer, figure out what they're eating and where they're eating it. In theory, this sounds easy, but in practice it takes a good deal of woodsmanship. First, you have to understand one more zoology lesson. Generally speaking, deer seek out different types of foods based on the season and their nutritional needs. According to Dougherty, this can be broken down to protein types of foods and energy types of food. Deer focus on protein type foods from April to August. Deer often seek out protein found in various types of weeds, alfalfa and clover and even soybean plants. Deer utilize hundreds of high protein plants during the summer months. As fall approaches, their bodies start to crave more energy foods than protein foods. Energy foods help them pack on the pounds for the upcoming breeding season and winter. Initially they focus on soft mast like apples, pears, dogwood berries, plums, raspberries and blackberries. It’s safe to say deer eagerly seek out most fruits during the early fall. Don’t forget about weeds that produce fruit like polk weed, which is sought after late in the year and into the fall. Once it gets cold most of the soft mast is cleaned up and deer switch over to energy foods that are a little tougher to digest. 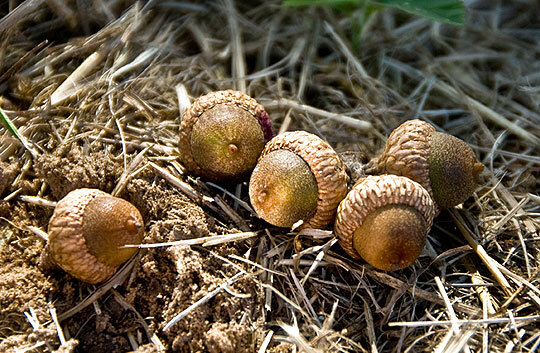 Acorns, beach nuts and corn make up some of the most preferred late season energy foods. Note; Dougherty has witnessed many deer walk through standing corn fields to consume dried soybean pods in a field that hasn’t been harvested. So that's what deer eat, now where's the best place to find these food sources? Deer are like lazy shoppers at a grocery store. They want to get as much food as they can with as little effort as possible. This means they're going to be targeting areas with the highest amount of food per acre (how many pounds of food are on a give acre). Armed with this information, it seems like you should just set up the biggest cornfield or brassica plot you can, but that's not necessarily the case. Dougherty says that many times your best bet is to find food sources like clear cuts in the middle of thick timber or flowering weed fields. 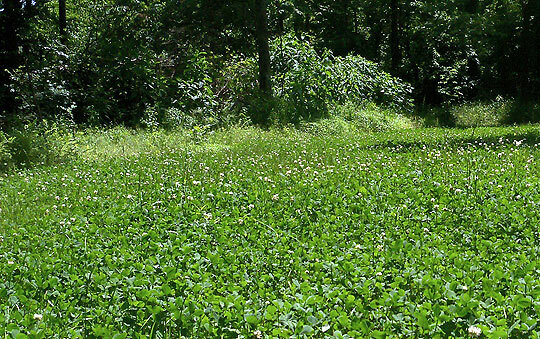 These are the places that are often overlooked by other hunters and the deer know it. Mature bucks look for safe, out-of-the-way feeding areas with a relatively high food-per-acre number. Also Dougherty recommends that you become more active while heading to and from your stand. Deer’s nutritional needs change quickly during the hunting season. Keep your eyes cast low observing the tell-tale signs of nipped off branches and fed upon weeds. Editor's Note: Each year wildlife consultant Neil Dougherty kills more than 100 mature whitetail bucks. But rarely pulls the trigger. His clients do the trigger pulling on the hundreds of properties he helps them manage. His unique approaches to property layout and hunting techniques have been featured on TV, and written about extensively. He prefers to hunt whitetails on his home property in western NY where he manages to take more than his share of mature bucks but still measures his success by the success of his clients. This article was published with permission from OutdoorLife.com.